Las Vegas is a city that parents and their teenage kids can certainly enjoy together. Yet, there are also plenty of Las Vegas entertainment options for everyone to have his own fun. Las Vegas, a city built in the middle of the Nevada desert, is truly capable of entertaining every generation. Besides the organized tours and fabulously themed family diners throughout the city, there are also a few shows that are geared toward the whole family. At the same time,letting the teenage family members go out and have some fun on their own is a good idea. This is particularly true for parents who wish to enjoy some gambling or to just spend a few hours alone. In addition, Las Vegas can feature some extremely romantic spots for parents to enjoy. Every parent knows that teenagers live in their own world for a few years. One of the main components of that world is videogames. Las Vegas features multiple arcades filled with games utilizing the latest technology. In fact, most resorts have an entire floor dedicated to the needs of the gamer. Virtual reality, 3D games, and traditional arcade games - the list is endless when it comes to the availability of videogames. Teenagers can literally spend hours at arcades. While there, they can also make new friends without ever leaving the premises of the hotel. Of course, it always helps make parents feel more comfortable knowing that their child is safely having a great time within the confines of the resort. Just be sure to give the teenager a limit on how much he or she can spend because things can get expensive without parental control. Las Vegas is home to some fun rollercoasters and thrill rides that will certainly be a hit with most any teenager. The teenage member of the family will most likely notice the Manhattan Express, which is a roller coaster located at New York, New York, immediately. This 203 foot tall coaster is located right in the middle of the Las Vegas Strip and reaches speeds of 67 mph. 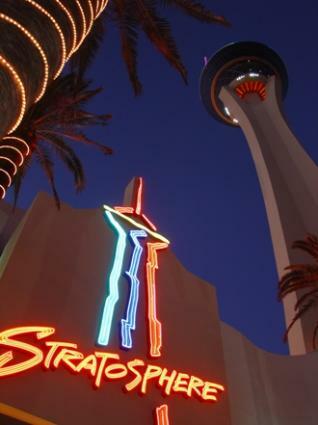 Stratosphere Tower will also occupy much of the teenager's time while in Las Vegas. Located on the northern end of the Strip, Stratosphere stands 1000 feet tall, making it the world's tallest thrill ride. Inside the tower is Big Shot, a wild and fun elevator ride that shoots riders to the top of the Stratosphere Tower. The High Roller Coaster and the Project X Sky ride are also located inside Stratosphere Tower. Project X Sky provides thrills and chills to the teenage visitor as this giant seesaw teeters them 1000 feet above the city for an exciting ride of a lifetime. Clubs in Las Vegas are mostly geared toward those who are over 21. There are, however, some special dancing events, usually held in the afternoons, that might include minors. It is a good idea to check with the hotels to learn more about these events. There is a regular movie theatre multiplex on the Strip that teenagers will enjoy. The Imax complex at the Luxor is also sure to be a hit. Many hotels include sport facilities, which provide great traditional entertainment for kids of every generation. Of course, there are also fabulous shopping opportunities available in Las Vegas. The shopping malls located in the hotels alone offer unlimited fun, even if visitors just walk around and go window-shopping. Even better, hotels are very safe and have very high standards of security. Gambling in Las Vegas is forbidden for anyone under the age of 21. Even just sitting within casino limits is against the law for minors. Therefore, it is important to be sure teenagers understand not to enter casinos and to not attempt to play. When left to their own devices, they may try to play a few slot machines. This is absolutely forbidden and can lead to serious consequences. Therefore, it is important to be sure they understand the rules clearly. Another caveat in Las Vegas is to be careful when communicating with people in the street, particularly just off the Strip. Although Las Vegas is very clean and under surveillance at all times, there are a few spots where people will take advantage of teenagers seeking entertainment. They may even approach with promises of fantasies and fun they have never experienced. Most teenagers are aware of these things and are very smart, but a little refresher beforehand on how to handle certain situations is a good idea. It is better to be safe than sorry. With advanced planning and clear discussion of rules and safety, Las Vegas is certain to be a vacation for the entire family to enjoy.